One of the most popular winter sports, especially in Europe, is ski. In ski, as in many other sports, there is a great deal of science. The next time you put on your skis and get on the slope, try to notice the movements you are making. You will discover, as in any other place, that your body movements are governed by the forces that are being applied to you, and that you respond to those forces with body movements that help you control your motion. In ski, the surface we move upon is smooth, very smooth in fact, and we aim at moving as fast as possible, while maintaining control. In other words – creating a regulated amount of friction. Why is the snow slick? Snow has resistance, similar to the resistance sand has, but when we get on the skis we glide, due to a number of reasons. First, skis have a large surface area, and thus our weight is more distributed on the surface, which prevents us from sinking into the snow. Also, the skis are coated with water-repelling substances that assist their snow-gliding properties. How do we turn? According to Newton’s first law of motion, an object will continue moving at the same speed and in the same direction, as long as no force is applied to it. We slow down or stop due to the force of friction that we generate. In order to take a turn while walking, we lean on one leg, and make a wide movement with the other, like calipers. While walking or running, we do this almost mindlessly. While skiing we do the same – lean on one leg, and point the other in the direction of the turn. 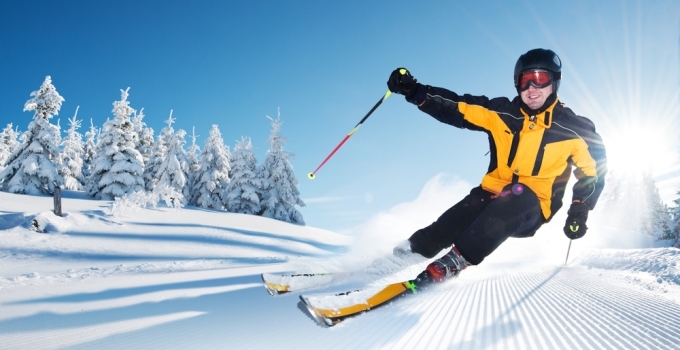 Why do skiers lean forward? 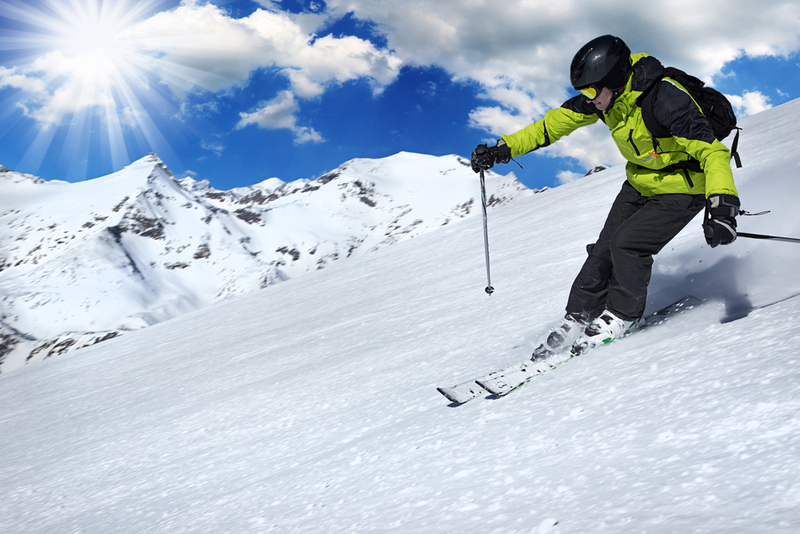 While skiing, it is important to bend and lean forward for two reasons. First, we wish to reduce our surface area in order to have less wind resistance (and to not get as cold). Second, we wish to lower our center of mass and improve our stability. Take notice to the fact that professional skiers lean sideways in very sharp turns, almost touching the snow. They do this in order to not lose their balance and fall. A similar phenomenon can be observed in motorcycle races. Why do we slalom while skiing? A skier slaloms (moves in a winding path) down the slope and not in a straight line. The reason for this is that in ski we always advance downwards, i.e., gravity accelerates our movement, and the steeper the slope, the higher the acceleration is –meaning, our speed increases more rapidly. What does not change is our reaction time, which allows us to make small corrections, and is still about three quarters of a second. In other words, about seven and a half tenths of a second pass from the moment we receive information until we react according to it. The faster we move, the farther the distance we will pass during this time. In addition, at high speed a stronger force is applied to us during turns, and exactly as would happen if we were to enter a sharp turn with our car too fast, we would feel that we are thrown to the side. Moreover, the movements that we would do will have a stronger impact on our skiing, and we would have to perform more subtle corrections. In sum, we will most likely find ourselves with our face in the snow. The key is to intentionally slow down, and skiers have two methods to do this. The first is to increase their friction with the snow by spreading their skis (this is more effective at lower speeds), and the second is to increase their friction with the snow by making short turns and by sticking the skis in the snow, this is what creates the slalom motion. Is it possible to climb up the slope wearing skis? Skiers that are not very well trained will not always be able to finish their track right next to the cable car, and therefore will be forced to walk a great distance on the snow wearing their skis, at times on an ascending slope. In this case there is, again, a way to walk: you should maintain the skis in a V shape and stick them in the snow as you walk. Actually, there is a whole type of sport involving skiing up a slope, in which participants ski in a V shape, while using force from the arms and legs in order to move forward. For the more advanced skiers, there is a sport called ski jumping, in which the goal is to reach the furthest without touching the ground. In the beginning of the track there is a ramp, which, in contrast to common belief, does not have an elevation at its edge, but the skiers jump off it after sliding down on its entire length. At the levitation phase two main forces are exerted upon them: gravity that pulls them down, and on which they have no influence, and the wind resistance coming from the front. In order to reduce this resistance, the skier bends forward and lifts the skis upwards. In addition, the skier makes a V-shape between the skis in order to increase the surface area, and to create more friction with the air beneath, thus slightly slowing down the fall. The world record for ski jumping, set by the Norwegian skier Johan Evensen, currently stands at 246.5 meters. The video was produced by The Curious Engineer. Our day of skiing is over, and we are back at the hotel. In the meantime, the snow makers are working hard in order to recover the tracks. There are two types of snow guns. The first uses a water hose and a condensed air hose. The water mixes with the condensed air and is sprayed inside the gun, there the water drops distribute, freeze and crystallize. Sometimes, small dust or protein particles are added to the water in order to induce faster crystallization. The second type of snow guns work using a heat-pump principle. They pump in air from a partially full water container, thus causing more water to evaporate and fill the empty part. As water evaporates, it takes along with it part of the heat (this is why it is called a “heat pump”), and the water particles in the container freeze. The frozen particles are separated from the water and dispersed as snow.